Foals offers classic camp activities with an added specialty focus on horses and western horseback riding. Campers will spend 2.5 hours each day of camp riding (weather permitting) and additional time learning about horses, riding styles, and equestrian grooming and care. Pony campers are assigned a horse of their own for the entire week of camp and share in daily care, grooming, feeding and maintenance. 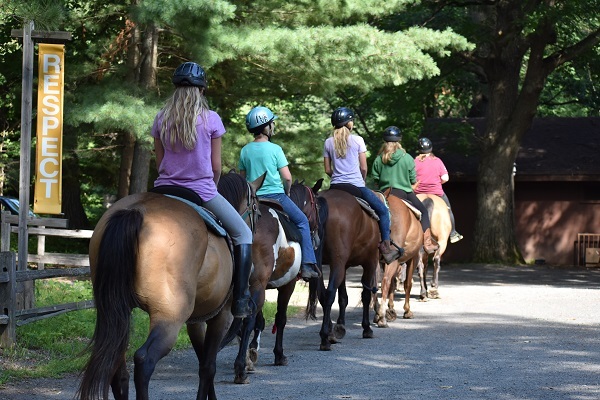 In addition, campers spend 2.5 hours each day riding western (weather permitting) and additional time learning about riding styles, working their way towards trail riding, and equestrian grooming and care. Fillies develop their horsemanship skills by caring, training and riding for 2.5 hours each day at camp before embarking on a four-day wilderness horse camping trip. Fillies must have previous horseback riding experience in Foals, Ponies or comparable experience at another camp.